Temple of the Reclining Buddha | Let's Go for a Trip! Wat Pho is possibly the most interesting temple in Thailand as it combines history, medical science and is a center for meditation and traditional massage training. Directly adjacent to the Grand Palace, it is also known as the Temple of the Reclining Buddha. The temple is also known as the birthplace of traditional Thai massage. Prior to the temple’s founding, the site was a centre of education for traditional Thai medicine, and statues were created showing yoga positions. Under King Rama III (1824-1851 A.D.), plaques inscribed with medical texts were placed around the temple. 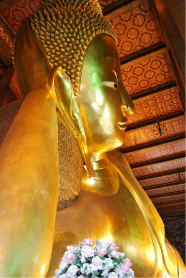 Wat Pho is most famous for the golden reclining Buddha that measues 46 metres and has feet inlaid with mother-of pearl. There are 108 bronze bowls in the corridor indicating the 108 auspicious characters of Buddha. People drop coins in these bowls as it is believed to bring good fortune, and to help the monks maintain the wat. The temple is considered the first public university of Thailand, teaching students in the fields of religion, science and literature through murals and sculptures. In more modern times, Wat Pho has gained international recognition as a meditation centre and for the traditional Thai massage that is both practiced and taught here. In the late afternoon, traditional medicine practitioners are there to dispense herbal mixtures. Nearby, there is a cloister where you can have a traditional Thai massage for a very small payment. How to get there : SkyTrain to S6 Saphan Taksin Station (Silom Line). Leave via Exit 2 and take a Chao Phraya Express Boat at Sathorn or Central Pier to Tien Pier (N8), then walk straight to Wat Pho. You can take the Orange Flag boat at 15 Baht.